It’s important that you know how to check your tyres’ tread depth. After all, the tread depth affects handling and provides grip with the road surface. The deeper it is, the more grip you’ll have. *Test conditions: 195/65 R15 91V, ContiPremiumContact™ 2, VW Golf IV, braking on wet, from 80km/h to 0 km/h (status: 2007). The graphics shown here are for illustration purposes only. The braking distance of a vehicle depends on its type, its age, the brakes and the tyres used, as well as the road surface (Source: Continental Reifen Deutschland GmbH). Tyre pressure in relation to the vehicle manufacturer's recommendation (Source: Continental Reifen Deutschland GmbH). A new car tyre begins life with approximately 8-9mm of tread depth. Legally, you can drive on them until they reach a minimum depth of the tread of 1.6 mm, across 75% of the tyre’s width and all around its circumference. However, we strongly recommend that you replace your summer and all-season tyres when they reach 3mm and your winter tyres at 4mm. That’s because, once they reach those depths, the tyres start to wear quickly. 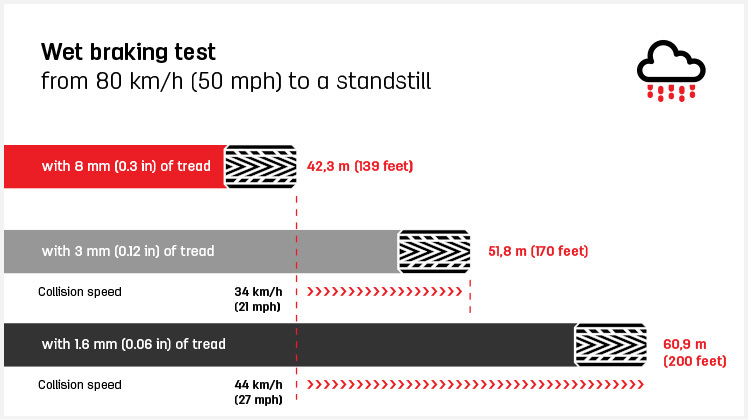 First of all, check out the tread wear indicators that are built into the grooves of your tyres. These small horizontal bars are evenly spaced around the tyre’s circumference. Once your tyre has worn level with these bars, you have reached your minimum depth and your tyre will need replacing. Bear in mind though that these indicators tell you when you’ve reached 1.6mm. That may be the legal minimum but it is shallower than our recommendation. A more accurate measurement can be taken using tyre gauges. These come in many different forms – from laminated cards with colour indicators to digital tyre depth gauges. Simply place the gauge into the tyre’s groove and you will see how close you are to reaching your minimum depth.